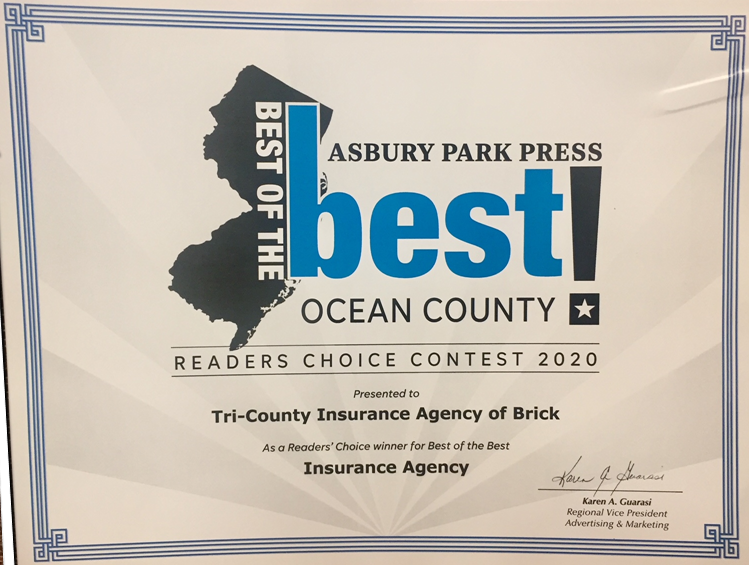 Conveniently located on Route 88 East in Brick, New Jersey, Tri-County Agency is a family owned and operated agency that has served Ocean & Monmouth Counties for over 45 years. Tri County Agency is also licensed in Pennsylvania, Maine, and Georgia and we have recently expanded to service clients in these states. As a family owned business, we believe in the importance of staying active in the community and staying loyal to the clients we represent. Over the years our agency has grown and has adapted to the needs of our clients by increasing the number of companies we represent as well as broadening the various line of products we offer. We are proud to say that we have been a “Best Practices” agency for the past 12 years. We are also a Trusted Choice® agency and are dedicated to treating you as a person, not a policy. For over 45 years we have made it our mission to solve any problems related to your insurance coverage with efficiency and superior service. Tri-County Agency of Brick is also a New Jersey Notary Public. Along with being a "Best Practices" and Trusted Choice® agency, we strive to keep up with industry standards by obtaining insurance designations and attending continuing education courses on a regular basis. We look forward to passing this knowledge onto our clients through our professional and friendly customer service.